Our heavy duty USA 3 pin plug to IEC C13 Power Cord is black and reaches six feet providing adequate connection length. This standard power cord meets the needs of computers; monitors; printers; and other peripherals requiring this type of plug connection. When your sensitive equipment requires a heavy duty power cord; this one is a great choice. Connections include a 3 pin plug to IEC C13 and it is made of 18 gauge wire for durability. 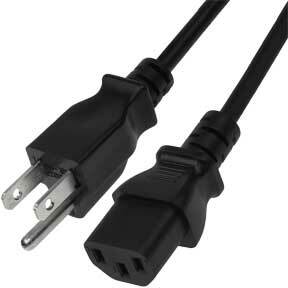 This power cord is black and six feet in length as well as UL and CSA approved. If your PC or peripherals require a power cord that has a right angle IEC C13 connection with a USA 3 pin plug; ours does the trick. This black wire cord is six feet long to meet distance needs; is CSA approved and rated up to 125 volts and 10 amps. Angled USA to C13 Power Cord contains NEMA 5-15P USA ultra low profile angled 3 pin plug to an IEC C13 connection. It is black in color; six feet in length and UL approved. Use this cord to power two devices with a single cord. Plug the 2 female ends to each device and plug the male into a standard power outlet. This power cord works great with devices such as a PC; monitor; scanner or printer. This cord is designed with quality in mind. This long lasting; high-quality cord will keep your device powered on and working great. Let SFCable's high quality power cords power your devices. Cable Type: Heavy-Duty 18AWG. Length 6FT high quality power cord. Color: black. 110/120 volt. Use this cord to power two devices with a single cord. Works great with devices such as a PC, monitor, scanner or printer. You can find a wide range of American- US power cords in our store. You can choose from power cords connecting NEMA 1-15P 2-pin - Male, NEMA 5-15P - Male, NEMA 5-15P - Male , NEMA 5-15P 3-pin - Male , NEMA 5-15P 3-prong - Male to C13 Right Angle - Female, C13 - Female, C13 Left Angle - Female, C5 - Female, and C7 - Female. All of them are available in various lengths and specifications. All our products are manufactured by ISO 9001-2000 registered manufacturers to provide highest quality. Moreover, all the products are offered at very competitive prices and are eligible for lifetime technical support by SF Cable.